Birmingham City defender Martin Taylor returned to action on Tuesday for the first time since breaking Arsenal forward Eduardo's leg last month. 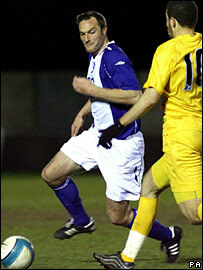 The 28-year-old Taylor played for the entire game for Birmingham reserves in the 3-3 draw with Tottenham. Earlier on Tuesday the Football Association had rejected Fifa's call to impose a longer ban on Taylor. The defender was shown a red card and given a three-match suspension for his tackle in the 2-2 draw on 23 February. With Birmingham just two points above the drop zone Blues boss Alex McLeish must decide whether to recall Taylor for Saturday's away game against relegation rivals Reading. Fifa disciplinary chief Marcel Mathier said the FA should have increased the ban. But an FA spokesman said: "It would be unreasonable at this stage of the season to change our disciplinary procedures on the basis of one case." The spokesman added: "That would be a dangerous precedent to set. "Serious foul play carries a three-match ban and the only cases where that has been increased is where there has been a clear case of intent and no-one is suggesting that happened in this case. "We will be reviewing our procedures at the end of the season and consulting with the whole game, and dangerous tackles are certainly an area we will be looking at. "We will also be requesting a meeting with Fifa for their input." Fifa president Sepp Blatter took a personal interest in the case and demanded the file be sent to his disciplinary head. The world governing body said in a statement: "The file on the sanction imposed by the FA on the player Martin Taylor was received and thoroughly reviewed by the chairman of the Fifa disciplinary committee. "A letter was then sent requesting the FA to once again review the incident in detail and reconsider the sanction." Will Taylor return to Birmingham's first team? Eduardo, who suffered a fractured left fibula and an open dislocation of his left ankle, has said he is uncertain when he will be able to return to the game, with estimates for his recovery time ranging from nine to 15 months. The 25-year-old Croatia striker will miss Euro 2008 and his nation's World Cup qualifier at home to England on 10 September. Taylor has repeatedly insisted that the tackle - in the second minute of the game - was mis-timed and that the incident was purely accidental.